Treat yourself to classic style with this Rose Silver and Surgical Steel Helix Bar. 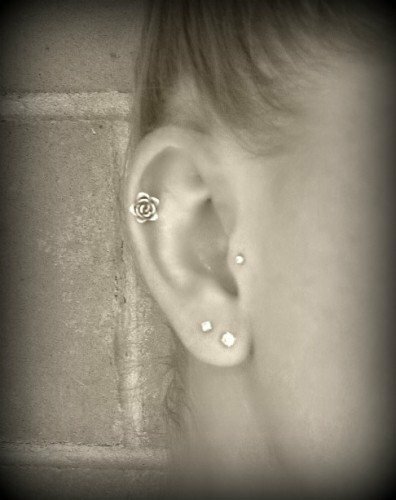 This cute helix piercing bar features split rose design in 925 silver. The two rose sections screw onto the surgical steel bar. The two sides of the rose sit comfortably on either side of your ear so it looks great in any ear lobe, ear rim or helix piercing. Size of the rose is approximately 7mm across. I bought two of these so I could have the option of wearing them in my lobes or put one in my helix :) They look wonderful either way, but I prefer it in my helix, as you can see the back more clearly :) I've had compliments already, absolutely love it! Got this today in the mail. It's super cute. Looks way better in person. I bought this and I'm really glad I did! It's so cute and fits really nicely. Great buy. it is very beautiful and perfect size for my cartilage piercing. so pretty my sister is getting one too. Its a MUST HAVE. I love the product, though did think it was going to be a little bit smaller, and didn't realise it was the rose that screwed on, rather than the back being pushed on - made it tricky to get into my piercing, as it goes in through the back. I've had this since Christmas, and it's still going strong! Looks silly in my tragus piercing, but suits the helix just fine. This was a bit bigger than I first thought so it kinda overwhelms my helix but it would look great for special occasions. I'll probably buy another because it also looks super cute in my lobes! Hey, I purchased the Helix rose bar, its so quirky and lovely! The service was really fast, it was despatched the day after I ordered it and then recieved it the day after that, excellent, thankyou! !